Washington, DC-based metal quintet DARKEST HOUR has filmed an official video for the song "Enter Oblivion", which hails from their eleventh LP, Godless Prophets & The Migrant Flora, released in 2017 through Southern Lord. The new video has been issued as the band prepares to embark on a new run of tour dates on two continents. The new video for "Enter Oblivion" was directed by DARKEST HOUR vocalist John Henry with director of photography Ben Hoffman and produced and edited by Chad Fjerstad. Henry states on filming the video, "I wanted to find a location that I felt would represent the nomadic theme of the song. When I came across Rainbow Basin outside of Barstow I immediately knew it was the right spot. There's a real beauty about the bleakness and harshness of the desert which stands out as the true star of the video." Adds guitarist Mike Schleibaum, "We chose the song "Enter Oblivion" because it shows a different side of the album then we first presented. This song sits in the middle of the album and although it doesn't crush with the same speed as the others it presents a depth that is all its own. The style of this song really allows for the band to breath sonically and the production of Kurt Ballou to really stand out on this track, especially in those drums! This is song for those who live outside of the borders of man and the laws of nature. For those who have found themselves in the act of constantly searching." See DARKEST HOUR's "Enter Oblivion" on KNAC.COM right HERE. 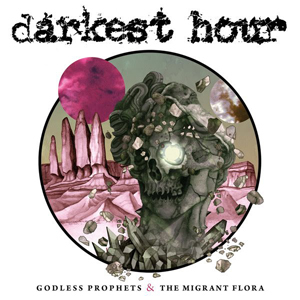 Produced by Kurt Ballou at his Godcity studo, Godless Prophets & The Migrant Flora continues to solidify the long-running DARKEST HOUR's legacy as a major metal powerhouse. Raw, complex, melodic, yet cutting with razor blade precision, Godless Prophets & The Migrant Flora is a fierce album which shows the long-running band as lethal and ravenous as ever. Godless Prophets & The Migrant Flora is available on CD, black vinyl LP, picture disc LP, and all digital platforms via Southern Lord; find ordering options at the label's webstore, and via Bandcamp. Following several crushing runs through different regions of North America in support of the album, DARKEST HOUR is about to embark on the first of two new upcoming tours in two weeks. Beginning February 16th, the band will storm across the eastern US through February 25th, with support from WHORES and EXTINCTION A.D.
DARKEST HOUR has also announced another new tour in recent days, which sees them hitting Europe this Spring. The tour runs from April 5th and runs all the way through the 29th and sees them paired with CEPHALIC CARNAGE and HARLOTT supporting HAVOK.